Although running a newer version of the Tizen software, using the Gear S is different from using any of the older Samsung watches. It has a "spacious" 2-in curved screen that features its virtual keyboard. It must be a bit strange tapping out texts or emails on a curved 2-in screen, but Samsung auto-correct is reported to be quite effective. Despite its 3G radio, the Gear S isn't designed to replace your phone. But it can work partially without one. "We're doing something (with the Moto 360) that looks like a watch and acts like a watch but does much more," said Motorola's design head Jim Wicks. during an introductory session to the Moto 360. The Moto 360, when paired with the new Moto X and the Moto Hint. As with other Wear watches, simply saying "Ok, Google" calls the Moto 360 to attention to answer queries. 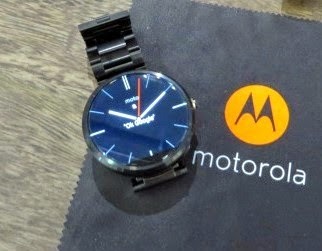 The Moto 360's display is 1.56 inches across with resolution of 320 x 290 (205 pixels per inch). A 320 mAh battery should get you a full day of use. It has a TI OMAP 3 processor with 4 GB of internal storage and 512 MB of RAM. Dual microphones give better voice recognition. It has a water resistance rating of IP67.